This is an advanced tutorial for modifying Kaltura embed code to make the video's width scale to the size of the container in which it is embedded. This is one option for scaling embedded Kaltura videos so they display nicely on phones and tablets. Content in this tutorial was borrowed from CSS Tricks's post, Fluid Width Video. WARNING: This tutorial requires some knowledge of HTML and CSS. You will be modifying HTML directly. These instructions are meant as a suggestion. You may need to modify the HTML in your site to make it work better. Paste your embed code into the div you created in step one. Your embed code should replace [Kaltura embed code will go here]. 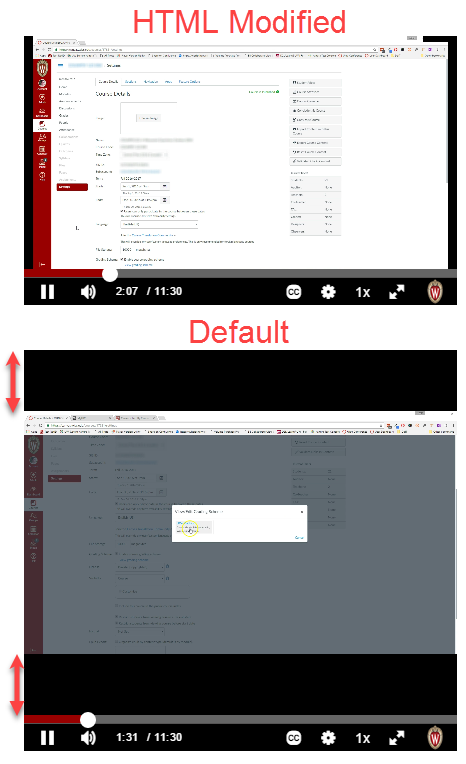 Your video should now scale to the width of the container in which it was embedded. If you embedded this on a page, the width will scale to the page. If you embedded this in another div, it will scale to the width of the div. NOTE: By default, Canvas will scale embedded Kaltura videos. In the following image, the video on top was embedded using the method outlined in this document. The bottom video was embedded by copying and pasting unmodified Kaltura embed code. Notice the scaling differences between the two.